Police searching for a 54-year-old man in Gwynedd are asking people to check their gardens and sheds in case he has taken shelter there. An extensive search of the Harlech area for John Mitchinson is going on using dogs, the force helicopter and mountain rescuers. He was last seen mid afternoon on Boxing Day but his disappearance was reported to police on Tuesday. Insp Gareth Evans said they are anxious to hear from anyone who has seen him. 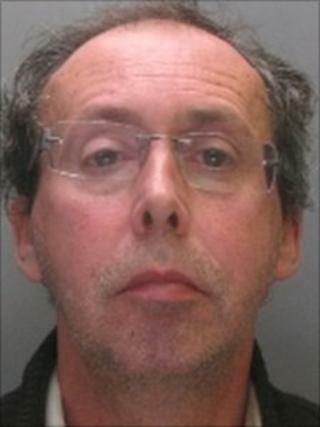 Mr Mitchinson is described as 5ft 8in(1.72m) tall and balding. He was wearing a navy blue raincoat and could be wearing glasses. Insp Evans said: "We are carrying out an extensive search around the area where he was last seen with the assistance of the mountain rescue Team, search dogs and the police helicopter. "But I would like to call upon the assistance of people living locally to the High Street to check their gardens and sheds in case he has taken shelter there during the cold weather over the weekend." "Anyone who has any information about his whereabouts or who may have seen him is asked to contact North Wales Police as soon as possible." Anyone with information should contact North Wales Police on 101 (in Wales) or 0845 6071001 (Welsh) 0845 6071002 (English) text 66767 or call Crimestoppers Wales/Cymru on 0800555111.